I know it’s not here yet, but we have to give you time to buy groceries and plan! 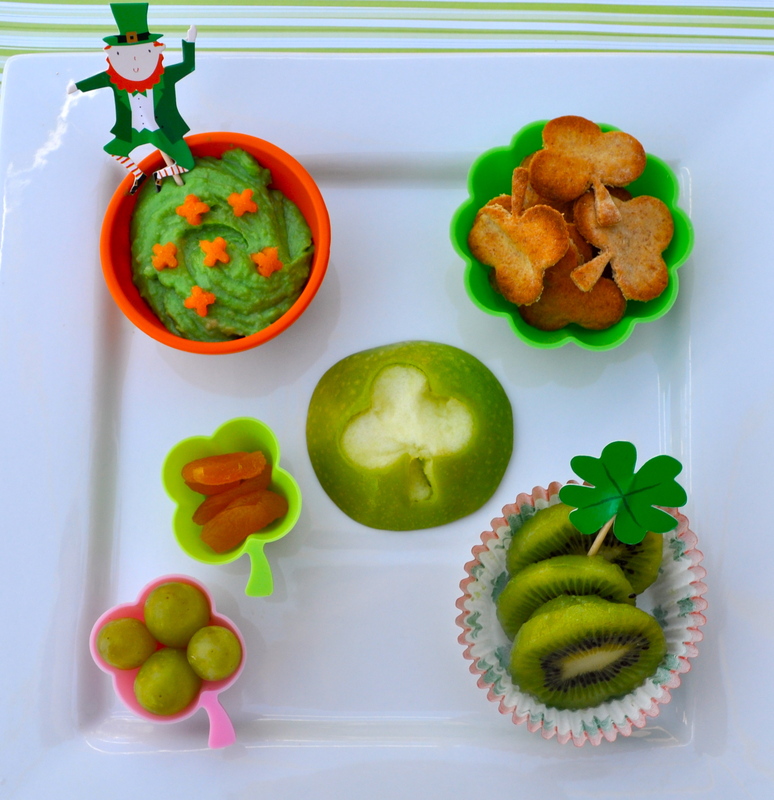 My bento buddies and I are doing a St. Patrick’s Day blog hop today. Little A found this Irish troll in Goodwill yesterday, and I decided he was a good mascot for today’s blog hop. When you get to the bottom, please click on the link to check out the next fun lunch. We’re on spring break this week and eating at home. Miss G is having green tinted hummus with carrot shamrocks on top. To go with the hummus are homemade clover shaped pita chips. She has an apple slice with a clover cut out of the middle. At the bottom right are kiwi slices and bottom left are dried apricots and green grapes. 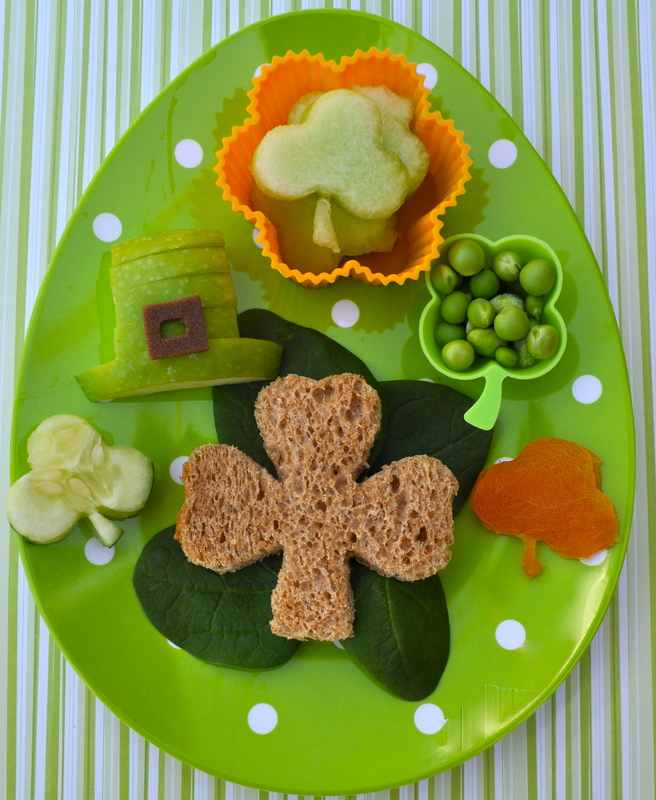 Miss A has a shamrock shaped sandwich on whole grain bread on spinach leaves. At the top are clover shaped honeydew melon, the green shamrock container has edamame and fresh snap peas and a clover shaped dried apricot is below that. At the bottom left is a clover shaped cucumber and above that is an apple hat with fruit leather buckle. And NOW please click on the link to go check out what’s awesome today in What’s In John’s Lunch Bag for more St. Patrick’s Day fun! 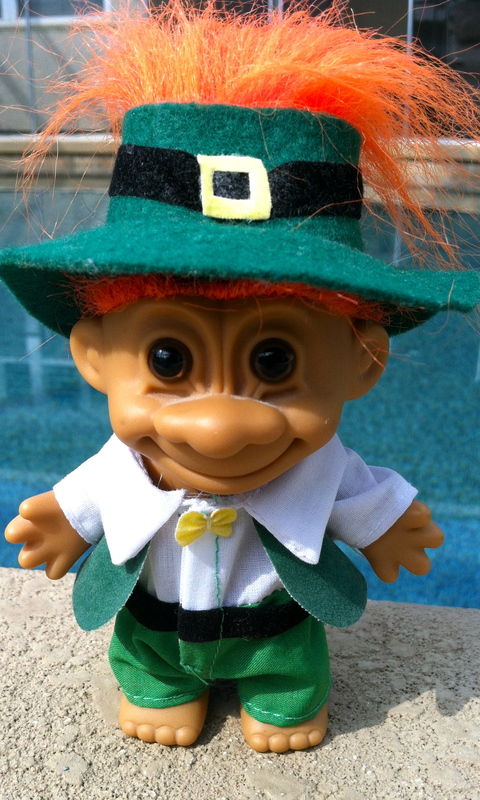 21 Responses to "St. Patrick’s Day Blog Hop"
LOL, love the troll doll! The green humus was a wonderful idea and the so are the homemade pita chips. Fantastic lunches, very creative! Love the troll. Love the pita chips. Love the apple hat. Way to think out of the (lunch)box 😉 Gorgeous lunches! the apple leprechaun hat is so cute! those pita chips look awesome! Love the troll! So cute! I love the photos! Great colors! Adorable! Love the hat and the pita chips!! I want to eat those pita chips! Yum! What a fun, healthy, green, sham-rockin’ lunch! They look beautiful! I think you just convinced me to go looking for a shamrock cookie cutter for next year! I’m honored to get such high praise from such a handsome fellow!